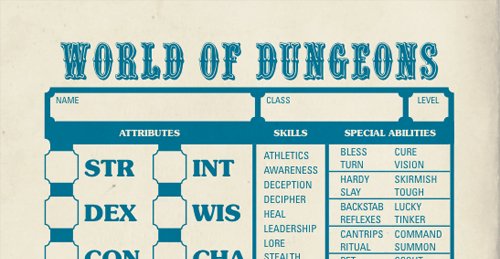 World of Dungeons is a complete short roleplaying game that answers the question "If Dungeon World was the latest version of a classic roleplaying game, what would the original look like?" Basically, it's Dungeon World 0E. We've been playing it for several months now, and it's been a blast. If you're a fan of classic dungeon games, or Dungeon World, or both, I think you'll dig it. How can you get it? By helping the Dungeon World Kickstarter reach $27,000 (about $1200 to go as of this writing). UPDATE: It's unlocked! Once it's unlocked, everyone who contributes at any level gets it for free. Curse you, Harper! Curse you! And here I am now, considering contributing to the DW crowdfunding just because of this. You'd better give me more info on this thing! For a starter, how many pages is it? Other highlights? MOAR SPOILERS! It's 6 "pages" -- 2 pages per sheet. Sheet 1: Two character sheets. Sheet 2: Equipment, Hirelings, Magic. Character Creation & Rules Summary. Sheet 3: XP & Leveling. Names & Regions. It's about the same amount of content as my other small games, like Lady Blackbird or The Wildlings. It's plenty to play the game, though. We've been playing it for months! You wrote a LB-class lite-RPG 6-page DW variant? Thank you, John. Why does John Harper always make games that make me want to play them instead of OTHER John Harper games?? Now I may have to supplant Pocket Danger Patrol as my always-in-any-bag-I-carry-around game. Oh, wait, they're all small. I'll have it in addition to DP!! I'm guessing we'd get a copy after the kickstarter is over? If you back the kickstarter, you get the PDF immediately (it's in the backer-only update #5). No waiting! Wish I wasn't flat out broke! I missed the Kickstarter. Will World of Dungeons be available at a different time in the near future? Yes, there will be a public version at some point (soon-ish). Damnit! Found this too late. I would have been happy to kickstart Dungeon World on the strength of prior released PDFs, but now that my appreciation for various versions has been strengthened by steeping myself in the OSR, this makes me all excited like. I'm with Tanner up there, I'll be happy to get a public version of this and DW. Hmm. As a Dungeon World backer, was I supposed to get an email about how to access World of Dungeons? If you go to the Kickstarter page, there's a "backers only" update post with the link to the file. So how do I get my copy of this? I helped fund Dungeon World, but I don't see how to get this. So now that Dungeon World is out, will World of Dungeons be available to the public? Yes, there will be a public version. Hopefully I'll have some time to put it together during the holidays (there are some edits and additions). JOHN!!! please provide a Christmas gift to us fan's ... all I want for Christmas is WORLD OF DUNGEONS!!! I've been a good boy. I tell everyone LB and Dangerworld are awesome. I agree, Please, please, please, please WORLD OF DUNGEONS PUBLIC b4 Xmas! Happy New Year would be keen if World of Dungeons would be seen! A cheer from all would ring about, World of Dungeons is out. Grab some dice and with dramatic flair tell those monsters to beware. So how can we get it if we weren't around for the kickstarter? It's not available yet. In the mean time, check out Streets of Marienburg (which is a Warhammer hack and includes all the rules plus extra stuff). Lots of really neat hacks out there! I have not had so much fun looking at different things since I found Old School Hack.